Pono Home may just be for you if you answered yes to these questions. Bring your passion for sustainability and healthy living into the homes of customers, and leave them breathing cleaner air, spending less on electricity, water, sewer, and waste bills, all while educating people about carcinogenic and GMO ingredients in food and personal care products. Pono Home is a green home consulting business that recently won the highly competitive green business plan competition put on by the Energy Excelerator, a Hawaii-based incubator of clean tech businesses. The concept is simple: convenience. Most people know that a smart strip could probably save them money, but do they know how to install one properly? Many people probably also know that they could cut their electric bill if they used less hot water in their shower, but wouldn’t have a clue how to get their teenage daughter to reduce her shower times (hint–you don’t have to….there’s other infrastructure you can put in place that gets the job done without teenage drama). Pono Home delivers sustainability! Everything from the building envelop inwards is greened during the Pono Home service, with an eye toward energy and water efficiency especially. Joining Pono Home gets you training and education about how to green a home, along with all the support you’ll ever need to run a successful franchise. The focus is on the low-hanging fruit, not the giant and expensive stuff that only rich homeowners can afford. The service is as effective for renters as it is for homeowners, in fact, meaning that we can finally help green some of the most inefficient homes in the world! And it all starts with you. Install the latest, greatest LED lighting technology. Install smart strips and show them how to use them. Install high efficiency plumbing fixtures. Show people how to cut the electricity their fridge uses by 20%. 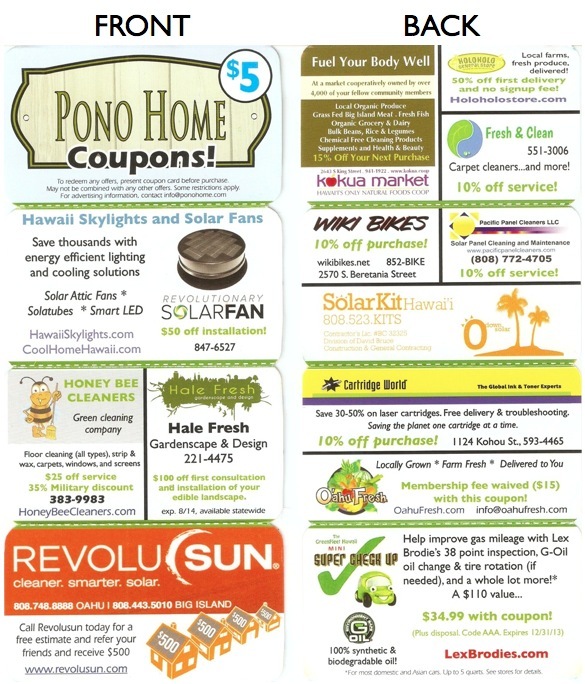 In addition, you get to do fun stuff like give people a Pono Home Coupon booklet to help them not just live in a greener home, but also take the next steps on their sustainability journeys. Check out the one we just made for our first franchise in Honolulu! The Pono Home Coupon Guide folds, accordion-style, to the size of a business card, and fits in any wallet. So how do you get started? Head on over to Pono Home’s website now and check it out. Franchising has begun in several states. Estimated impact? HUGE, and lasting. Build a legacy for yourself and your community. Make peoples’ homes pono and watch their carbon footprints shrink overnight.